Samsung has its own spin on Microsoft's Continuum. The road to the perfect phone-desktop hybrid is littered with the carcasses of ambitious failures -- just look at Microsoft's Lumia 950 and Motorola's Atrix. Still, that isn't stopping Samsung from giving it a go with a new dock for the Galaxy S8 called Dex. Since the S8 packs a top-of-the-line Snapdragon 835 chip that was designed with VR in mind, the idea here is that the phone can do double duty as a desktop machine. I tried out the accessory with an S8 plugged in and was particularly impressed with the way Samsung has customized Android for bigger screens. All told, the Dex has two USB ports, an HDMI slot, an Ethernet jack and a USB-C socket for power. With these connectors, you can hook your phone up to a display, wired keyboard and mouse for a complete desktop setup. You can also link accessories over Bluetooth, freeing up USB ports for external drives. Slide up the top part of the dock when you want to connect your phone. 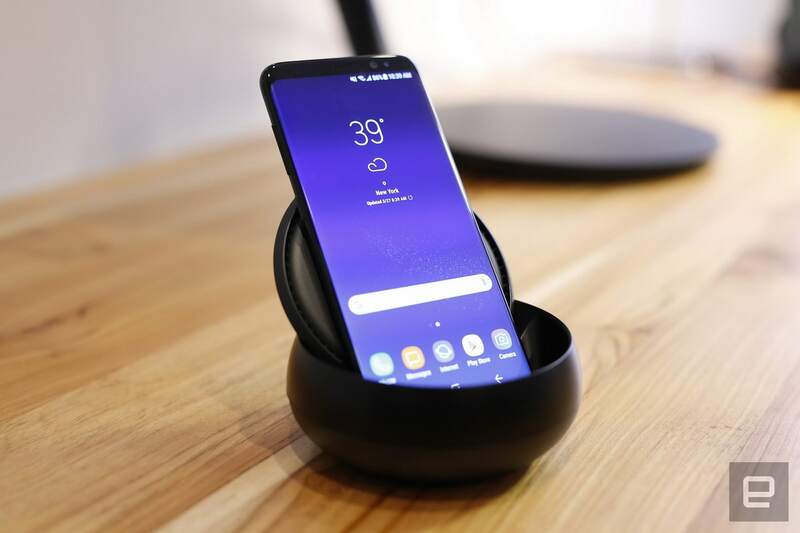 The disc flips out to become a stand, and on its underside is a fan that cools down the phone in case it starts heating up from running heavy-duty programs. Stick the Galaxy S8 on the USB-C connector at the bottom of the stand and the phone starts transmitting data to the linked peripherals. During a demo earlier this week, the plugged-in S8 was already connected to a Bluetooth mouse before it found the display over HDMI, so for a few seconds I was moving a cursor around the phone's screen. Samsung has customized Android 7.0 Nougat for a bigger screen and added some Windows-esque touches that make for a more familiar experience. There's an "all apps" button on the bottom left of the screen, similar to what you'd see on Windows and Chrome OS. Also at the bottom of the desktop is a taskbar that shows open apps, the time, and status indicators for things like WiFi, LTE and battery life. You can also pin favorite apps to this bar for easy access. When you launch Chrome or Samsung's internet browser while the phone is docked, you'll see desktop versions of websites by default as well. This tweaked OS also offers multi-window support, and each window can be resized freely, meaning you can lay out as many panels next to each other as you like. 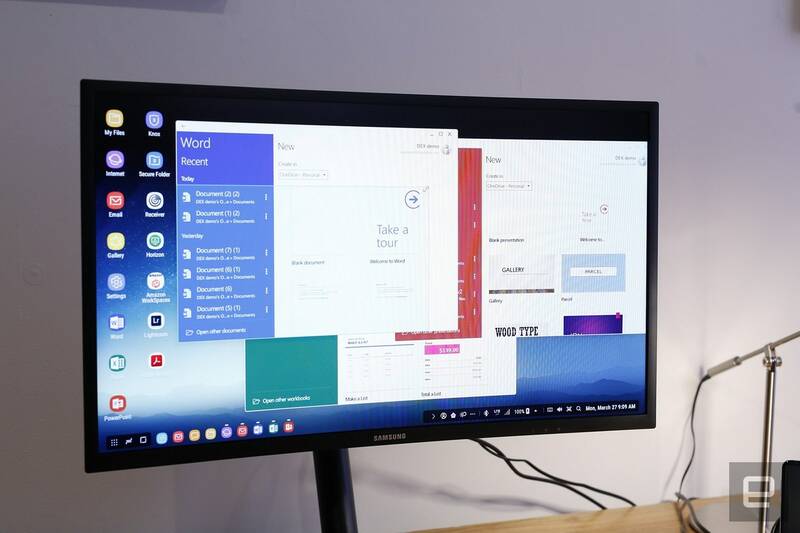 There's no hard limit on how many windows you can have open at once, Samsung says; you just might find the system slowing down depending on what you're doing in each app. Too many windows running video side by side, for instance, will tax the S8 so much that it stops opening apps. I didn't get a chance during my demo to really push the S8 beyond running three apps simultaneously, so we'll have to wait till we get our hands on a review unit to see how far you can go before the phone stops responding. When I tried writing in Word while having a Chrome window and YouTube open, the S8 ran smoothly -- for the most part. I noticed the slightest bit of lag; characters didn't appear on the screen as quickly as they would when I'm typing on a laptop or desktop. But a Samsung rep told me that this could be because of the keyboard's Bluetooth connection. Samsung also teamed up with Microsoft to optimize apps like Word, PowerPoint and Excel for Dex. What you're basically getting is the tablet version of those apps, and the main difference here is their resizable windows and keyboard shortcut compatibility. Currently, only a handful of apps support this resizing, including Adobe Lightroom and Photoshop Express. Oh, and if you really want an actual Windows system on the Dex, the S8 also supports desktop virtualization using VMWare, Amazon or Citrix. To be clear, this isn't the first time we've seen companies try to turn smartphones into desktop computers. 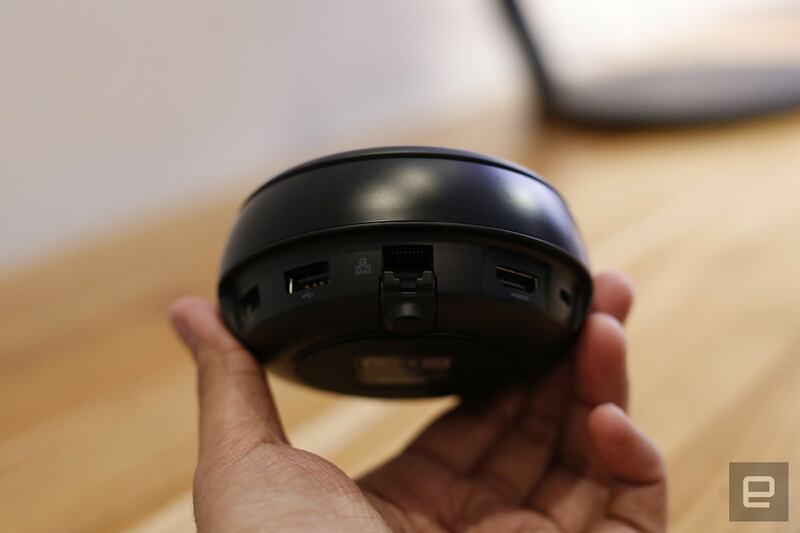 Most notably, Microsoft's Continuum feature for Windows 10 lets phone and tablet users convert their mobile OSes to fuller-featured PC-like setups. 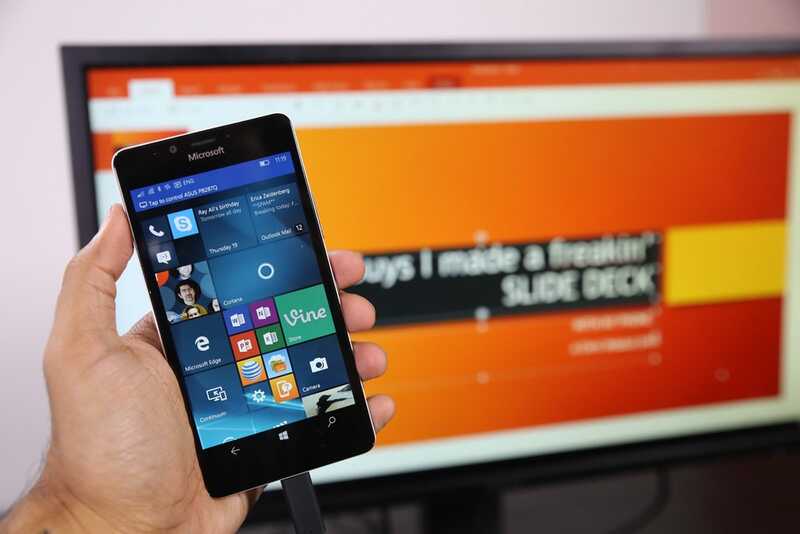 This debuted on the Lumia 950 and 950 XL handsets, and HP later attempted its own take with the Elite X3. But Microsoft's option only lets you run Universal Windows apps in desktop mode, and you can't freely resize the windows. Ubuntu also gave this concept a shot with its M10 tablet that doubles as a desktop, while ASUS did something similar with the PadFone -- a handset that slides into a tablet shell. Neither of those devices was very popular, though. None of those companies is the first to try and make PC substitutes out of phones, either. Back in 2011, Motorola came up with the Atrix -- a smartphone that became a laptop or desktop with the help of a dock. When plugged into the accessory, the Atrix ran a limited hybrid OS called Webtop that used a Firefox browser to launch web apps, while keeping the phone's screen open in a window. The company eventually phased out that feature, citing a lack of adoption. Samsung may very well run into that same problem with the Dex, and we have no way of knowing how popular it will be. The failures of the Atrix, Continuum and Ubuntu make us wonder if the format will ever succeed. From my preview, though, the customized experience here, plus the S8's potential to deliver fast, stable performance, makes Dex at least worthy of a closer look. Samsung hasn't revealed how much Dex will cost or when and where it will be available, nor whether it will eventually be compatible with other devices. For now, Dex's most compelling feature is its big-screen-friendly version of Android. I particularly appreciate that Samsung incorporated familiar desktop-inspired elements into the software, such as a taskbar, resizable windows and keyboard shortcuts. Dex still has its limits, particularly its small selection of compatible apps, but if this early iteration is any indication, it may provide a compelling way to bring Android to the desktop. The future of phone-desktop hybrids, however, is still uncertain.